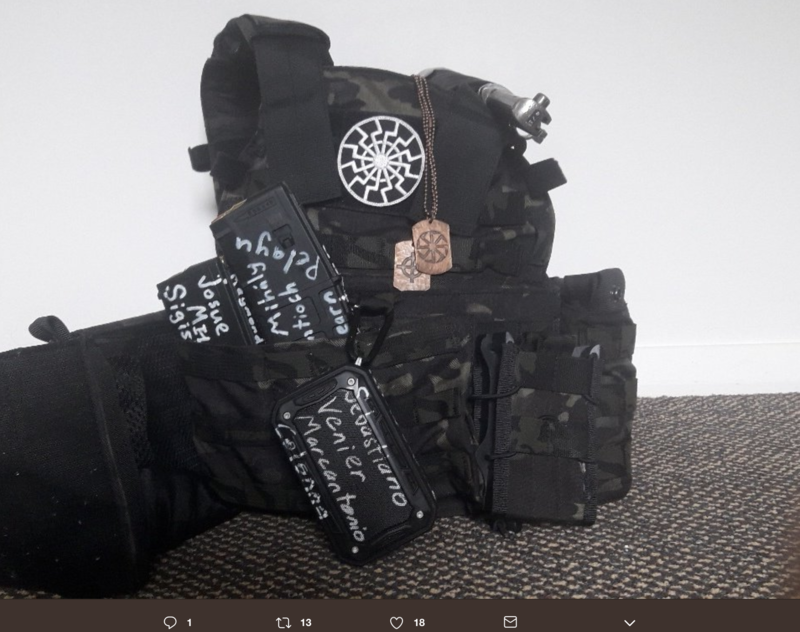 The New Zealand suspect’s 74-page manifesto offers a roadmap to understanding that language — and to understanding how the far-right online echo chamber can turn into real-world hatred and violence. The gunman, who was born and raised in Australia, was arrested and charged with murder after he allegedly killed at least 49 Muslims at two different mosques where they'd gathered for their Friday prayers. He broadcast the attack on Facebook Live via a GoPro camera. In his manifesto, he describes himself as “just a regular white man, from a regular family.” He said he relocated to New Zealand with the specific goal of plotting and carrying out a vicious attack on the nation’s Muslim community. His most recent known employment was from 2009 to 2011 as a personal trainer at a gym in New South Wales, Australia, according to ABC Australia. VICE News read the manifesto and identified sections to help explain and contextualize the shooter’s ideology as part of a violent, global movement that often begins in online forums and can turn into real-world actions, as it did on Friday in Christchurch. Warning: Some of the passages are disturbing. In his manifesto, Tarrant says that he was recently working “part time as a kebab removalist.” “Kebab removal” is a 4chan or 8chan meme that references the genocide of Bosnian muslims, called Turks, in the 1990s. The suspect’s clothing and guns were covered in other code. 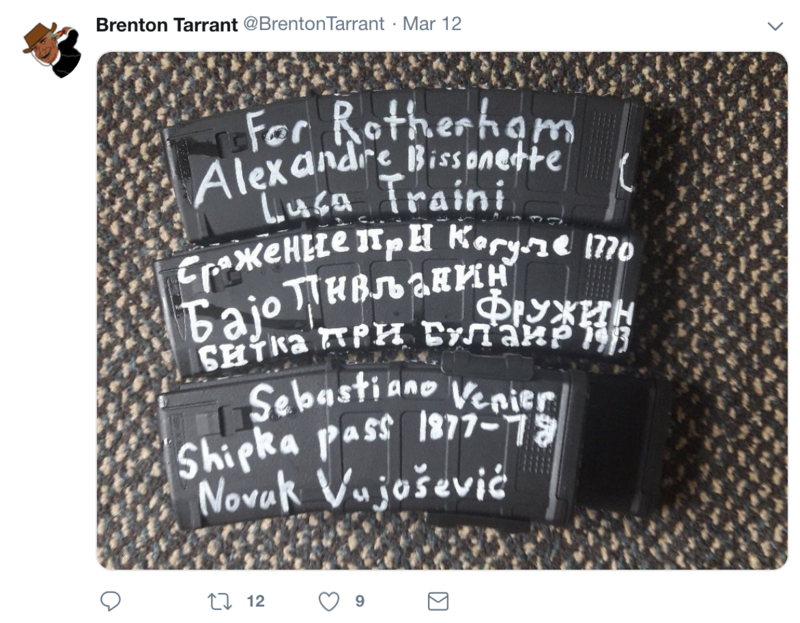 He’d also written “kebab remover” in white paint on one of his semi-automatic rifles, and he'd posted a photo of the gun on Twitter earlier this week. 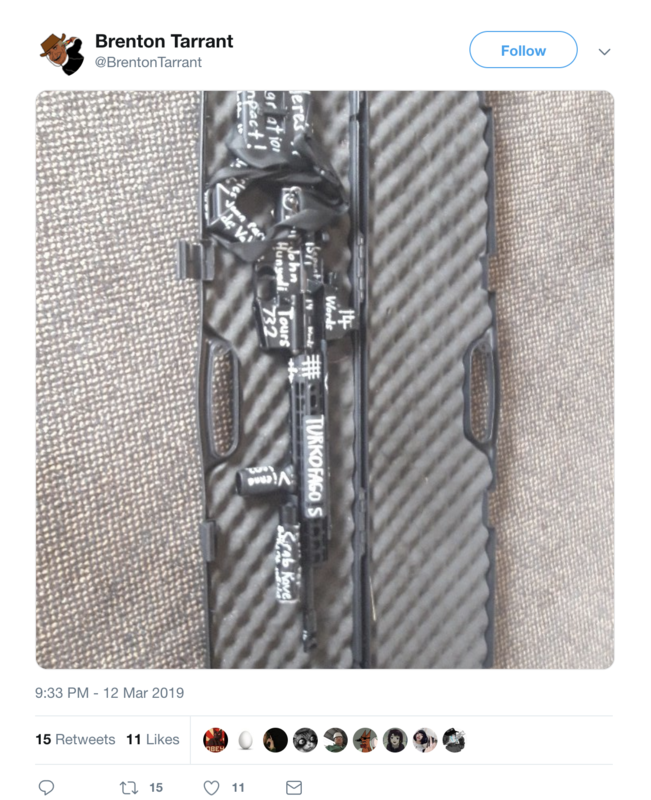 Another rifle had “14” painted prominently on it — in reference to “the fourteen words,” which is a white supremacist slogan coined by the leader of “The Order,” an American neo-Nazi terrorist group active in the 1980s. Other painted references included Sebastiano Venier, an Italian admiral who went to war with the Turks in the 16th century, and Luca Traini, an Italian right-wing terrorist who opened fire on a group of African migrants last year, wounding six. Tarrant also used the symbol of the “black sun” on his ammunition bag and on the front page of his manifesto, which is associated with Nazi Germany and neo-Nazism. Vanguard America, an American neo-Nazi group, also emblazoned their shields with the “black sun” symbol at the violent Unite the Right rally in Charlottesville, Virginia, two years ago. There are also numerous references throughout the manifesto to the religious wars of the Middle Ages, such as the Crusaders, and Pope Urban II, who urged Christians to go to war against Muslims in 1095 with the words “Deus vult,” which is Latin for “God wills it.” “Deus vult” were also words chanted by white supremacists as they marched through Charlottesville during the violent Unite the Right rally in August 2017. Tarrant, in his manifesto, trolls that he contacted the Knights Templar of the Crusaders for “their blessing” before he carried out his attack. Many white supremacists in Charlottesville carried shields and waved flags painted with the Knights Templar’s trademark red cross. Tarrant makes a number of references to Anders Breivik, the Norwegian neo-Nazi who killed 77 people in 2011. Breivik also left behind a lengthy manifesto, which has since become a mainstay of neo-Nazi and white supremacist ideology. Breivik touched on similar themes, like the Bosnian War, as well as the wars of the Middle Ages. He’d also allegedly inspired Coast Guard Lt. Christopher Hasson, who was reportedly stockpiling weapons and was following Breivik’s advice for carrying out a racially motivated, large-scale attack, federal prosecutors said recently in court documents. Tarrant also regurgitates slogans and ideas shared in more-mainstream channels of the right. For example, he mentions “marxists” at least five times, and “antifa” — the boogeyman of the GOP — twice. He talks about how the education system is overrun by Marxists, which is an idea that has galvanized young conservatives in the United States and inspired the creation of Turning Point USA in 2012. He talks about how “the mob” is controlled by “the global and corporate-run press,” which is rhetoric used by President Donald Trump and Fox News. He also rails against immigration, specifically from Muslim-majority countries. Like in many European countries and the United States, Australia has seen a surge in far-right nationalist groups organizing around and against Muslims. Those groups are connected internationally through an online diet of anti-Muslim propaganda and anti-Muslim conspiracy theories. Politicians have also adopted anti-immigrant sentiment; one Australian senator from Queensland was criticized Friday after he blamed New Zealand’s immigration policies for the shooting. “The real cause of bloodshed on New Zealand streets today is the immigration program which allowed Muslim fanatics to migrate to New Zealand in the first place,” Fraser Anning wrote in a statement on Twitter. Tarrant also makes numerous references to Ebba Åkerlund, the 11-year-old girl who died in a 2017 terror attack in Stockholm and has since been made into a key figure within far-right meme culture to peddle the conspiracy that whiteness is under attack. Her name was carved into one of his guns.